The Royal International Air Tattoo – An international airshow where forces and teams from around the world can exhibit their magnificent aircraft together. 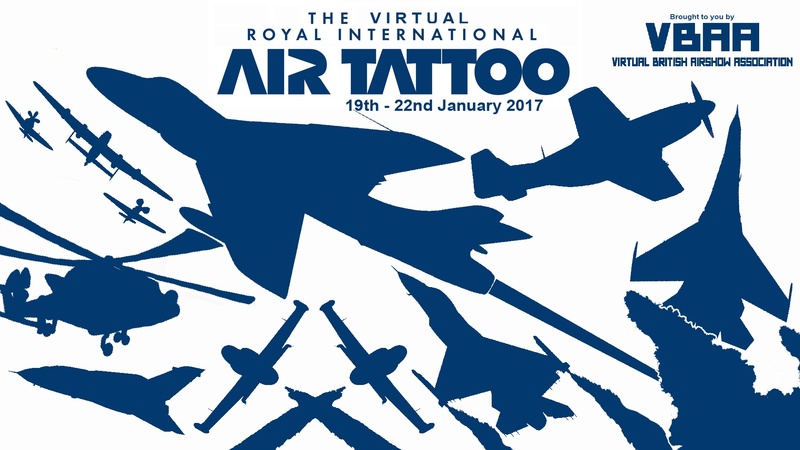 On the 21st of January 2017, the Virtual British Airshow Association are teaming up with demonstrators from around the world, to host the Virtual Royal International Air Tattoo. With a wide variety of aircraft, such as the American made F-22 and F-86 Sabre, to the British made Hawker Hunter, and even Russian made aircraft, we aim to bring the international aviation community right to your screen. With giveaways including three copies of Microsoft Flight Simulator X Steam Edition distributed by Dovetail Games, and another three copies of DTG’s new entry-level simulator “Flight School”, and various developers showcasing their new aircraft, we can’t think of a better way to kick start the 2017 virtual display season! The event will encompass three days – the first day will be the public flyin, in which all display and static aircraft will be flown in for the airshow, and an exclusive interview with Simworks Studios. Day two will be the final day for arrivals, but additionally the validation day in which aircraft and pilots are validated and certified to fly safely for the airshow. This day is also the opening day for the giveaway contests! The third and final day will be the day of the airshow, with many incredible aircraft performing exclusively for you, mixing aggressive high speed displays with the calm and graceful flypasts of World War II aircraft. It is on day 3 that the giveaways will be announced, the prizes awarded, and aircraft and pilots alike judged for their performances! Enquiries regarding performances and sign ups should be forwarded to Robert Skipworth, and enquiries as to the vBAA should be sent to Thomas or Curtis, either through email or through teamspeak, details of these can be found below! In depth details of the air show, and sign ups can be found on the FASA Forums, the link can also be found below. On behalf of all of us at the vBAA staff board, we look forward to having you with us and showing you the best of the best!